Weldon had a complicated early school life. His father was a journalist and chemist and due to his work, the family had to move around a lot, meaning that Weldon did not attend school regularly until he was 13 years old. His education before this time was sporadic and delivered by private tutor. In 1873, at the age of 13, he started at a boarding school, before going on to UCL in 1876 to study a ‘wide range of subjects’ that he hoped would lead him to medicine. Although he went to Cambridge to continue his pursuit of medicine, an influential lecturer turned Weldon’s attentions towards zoology and Weldon subsequently studied Natural Science. During his studies Weldon suffered both personal ill health and tragically, the death of his younger brother. Yet through it all he managed to attain a first class degree. 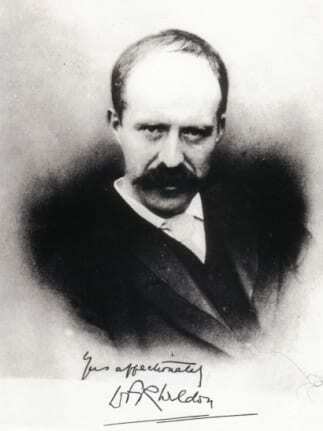 In 1882, Weldon became a demonstrator in zoology at the University of Cambridge, before being appointed university lecturer in invertebrate morphology in 1884. That same year, Weldon helped found the Marine Biological Association, for which he was elected a member of the council four years later, in 1888. Weldon married a lady who worked with him on marine biology. Around 1887, the Marine Biological Association opened a lab in Plymouth dedicated to marine biology and Weldon and his wife spent every holiday there undertaking research. By 1888, Weldon only went to Cambridge to deliver his lectures, and spent all other time at the lab in Plymouth. He came to UCL in 1891, taking over as chair of zoology from E. Ray Lankester. During his time at UCL Weldon carried out research on the morphology, classification and development of Decapoda, a group within the crustaceans. Unfortunately, the majority of his research was never published, however his findings were often the subjects of his lectures as professor of comparative anatomy at UCL. “He was one of the protagonists of the sharp encounter that took place between the champions of the “Mendelian” and the “Ancestrian” theories of heredity… The debate, which was conducted before a large and somewhat agitated audience, resolved itself into a dialectical dual between the president of the section [Mr William Bateson] and Professor Weldon, and developed quite a considerable amount of heat“. Weldon was notable for the work he did on the programme of International Fishery Investigations, at the Marine Biological Association. It is said that his keen intellect and unbounded enthusiasm added greatly to the ‘vast amount of statistical work’ incorporated into the study. Unfortunately, Weldon contracted pneumonia whilst at the lab in Plymouth. It became acute when he refused to give up work or take any rest. Suffering greatly, Weldon was admitted to a nursing home but sadly, at the age of just 46, he passed away, on 13th April 1906. Weldon is buried at Holywell in Oxford. 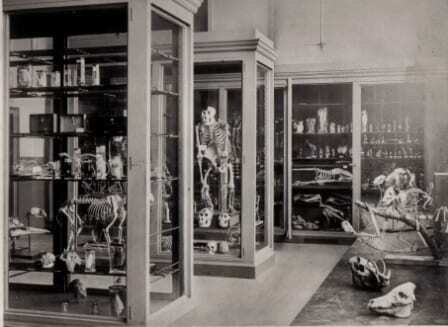 In terms of the Grant Museum, either Weldon did not add to the collections from his own research in his eight years, or he did not label any of the specimens with his name. Given that he spent all of his spare time at the MBA lab in Plymouth, it is likely to be the latter option, of not adding his name to the specimen labels. Either way, we do not know which, if any, specimens are his. and so the investigation started… in the Museum stores. Amongst the few hundred specimens in the store that were potential candidates for Weldon specimens, a number of them were labelled as Plymouth. However, these were all too young to be anything to do with Weldon, they were collected in the 1950s and 60s, according to their labels. I did find some specimens dating from the 1890s (see image above), during which time Weldon was at UCL, but none of these were labelled as Plymouth. Luckily, Museum labels tend to go through trends. The labels we use now look very different to the ones used 100 or 200 years ago. 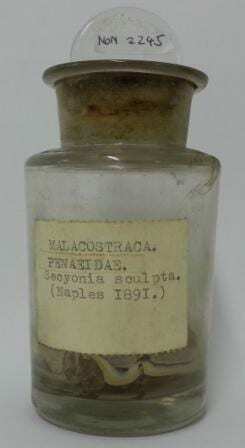 Although we also use different kinds of specimen jars, specimens can be rehoused, meaning that modern jars don’t necessarily mean modern specimens. Although not a certainty, it is fair that for some labels, and jars types, to assume that others that have the characteristics, are likely to be of the same period. There is more to this than can be explained in a short article. 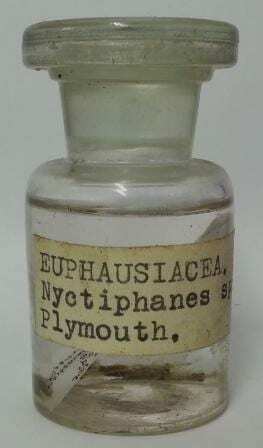 The specimens from the 1890s, one of which is shown above, had the same label type as a few specimens I found that were labelled Plymouth, and that gave no other evidence to contradict they were of the Weldon era. It is worth noting that the Nyctiphanes shown to the right, is of the class Malacostraca and not Decapoda, which was the focus of Weldon’s research. However, when collecting specimens it is more than likely that species of other groups will be caught, and it is normal that these specimens be brought in to museum collections. Although without further evidence it can’t be said for sure, if Weldon did bring specimens from his research in to the Museum collections, these are most likely to be the ones.